I’m thinking of titling my blog posts like titles of Jack London novel chapters. Goal for today was to get the kitchen to a point where I could put it away for a few days while I work on getting the wood floors re-finished. Didn’t get as much done as I was hoping, but it’s kind of hard to estimate how long it’s going to take you to do things that you’ve never done before. OTOH, I *did* get to chisel a lot of glue off of walls. Chiseling makes me sweat through my shorts. I’ve spent so much time here lately chiseling glue off of my kitchen walls that, last night when I closed my eyes to fall asleep, all I could see was a chisel clearing a white-yellow path through stripes of putty-colored tile glue, strips of adhesive flying off to either side. Occasionally my vision would morph into a chisel attacking low-profile stripes of glue stragglers, chipping away once, twice, before brown flakes flew from the wall. I’m serious, that really happened. Of course, the tragedy of spending an entire day chipping through 52-year-old glue is that, well, you can take all the pictures of it that you want, no one can really tell that you’ve done anything. 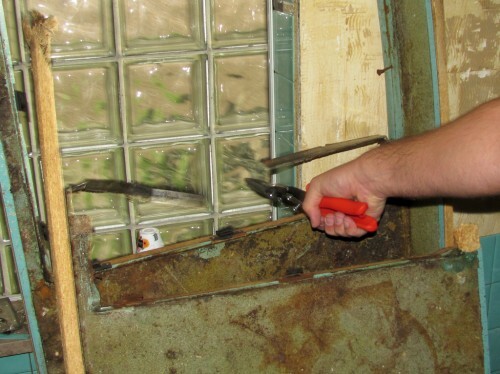 It was the moment I used tin snips to cut through the metal band that still held the counter-top together, even though I’d already smashed through the wood in order to get it off the top of the cabinets in the first place. I mean, that’s *the moment*, you can see the blur around the metal thing and stuff. 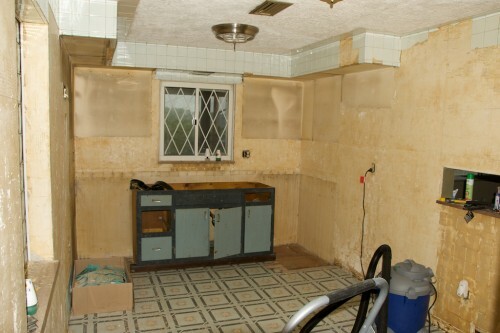 And the side of the counter-tops facing you? That’s the actual top of the counter. That’s why I was in a hurry to get this crap out of my house. I mean, you know, “hurry”. 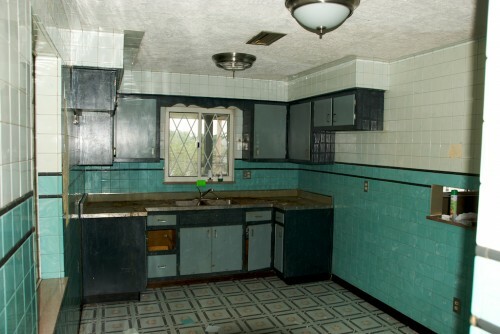 Here are before and current photos of the kitchen then. Shop-vac (vacuuming a pile of dried glue makes kind of a cool sound). Depending on whether something else distracts me, the plan today is to head out to Wilkins Twp to pick up the drum sander and then, you know, start sanding. Although I sort of need to get a washer and dryer really soon, so if Craigslist is willing, that might cut into my sanding time. Plus Red Dead Redemption is supposed to be getting delivered today. It’s a day rich with possibilities.